If you’ve visited an aquarium or fish store before, you have likely admired the beauty of the lionfish, a venomous marine fish originally found in the Pacific and Indian Oceans. These red and white striped fish can grow up to 18 inches in length, and weigh up to 2.9 lbs. They can live from five to fifteen years. They prey mostly on small fish, shrimp, mollusks, and anything that can fit into their mouths. The lionfish is one deadly fish. Lionfish stings can cause heart failure and death in young children, elderly individuals, or immune system compromised individuals. Venom from a lion fish spine can cause extreme pain, nausea, vomiting, fever, breathing difficulties, a drop in blood pressure, convulsions, dizziness, headache, numbness, heartburn, diarrhea, and sweating. Due to their venomous spines, they have very few natural predators. Lionfish have become an invasive species in the Atlantic Oceans. They are not native to this ecosystem and have decimated many coral reef fish populations, disrupting the natural balance of the reef. Without many natural predators in the Atlantic, lionfish can reproduce extremely quickly; one female can produce 2 million eggs a year. There is some speculation about how the Lionfish entered the Atlantic Oceans. Many believe that private aquarium owners introduced the species into the ocean when the fish grew too big for their home aquariums. It is also speculated that Hurricane Andrew caused the accidental release of several lionfish from a damaged aquarium in 1992. Other theories suggest that the lionfish hitched rides onto large cargo ships traveling between the Pacific and Atlantic Oceans. Lionfish populations need to be controlled to protect coral reefs. The most reliable way to currently catch lionfish is to scuba dive down to where they are located, up to 200 feet or deeper, and shoot them with spears. Traps don’t work well because they tend to catch native fish in addition to lionfish. One of our ports of call from our cruise trip was Costa Maya, Mexico. My friend Joe booked a lionfish hunt for us with Doctor Dive Costa Maya. They were very professional and easy to work with. We arranged a 2 tank dive, for $140 per person, including tip. We walked from the beach right onto the dive boat where we geared up. The boat ride was very short, probably less than 20 minutes. Our first dive was to explore the sea life and corals in the area. We saw tons of sea life including: barracudas, sea turtles, lobsters, fish, corals and rock structures. Our second dive was the lionfish hunt. Our dive master, Sam, went over the safety precautions of hunting lionfish with 3 pronged Hawaiian slings. A Hawaiian sling is a basically a pole with a spearhead on one end and a rubber tube on the other side. To use the sling, one grabs the rubber tube and pulls it tightly towards the spear head. Keep your arm straight to aim and simply let go of your grip on the sling to fire. As the rubber quickly snaps to contract, it causes the spearhead to propel forward at a high velocity. One great thing about hunting with a Hawaiian sling is that if you miss, you can quickly fire off another shot. We were not allowed to shoot at any other sea life. Sam frequently emphasized the importance of keeping away from the venomous spines of the fish. He even showed us several dark scars on his leg from a previous accidental brush with poisonous lionfish spines. Sam instructed us to to get within 1 foot of the lionfish, and aim for their heads before shooting so that they could be killed instantly. Our dive master took us to his “secret spot,” an undersea garden of lionfish, 70-80 feet deep in the ocean. We saw lionfish everywhere, mostly found hanging around rock structures and caves. Since lionfish have no natural predators in these oceans, they had absolutely no fear of us. As we swam up to groups of lionfish, they didn’t bother swimming away at all. We could get right up to them with our spears, take aim, and fire. While hunting, Sam made sure that we were not to handle any lionfish after catching them. After each catch, we would bring the spear with attached lionfish back to Sam, who would give us a replacement sling. Sam collected the lionfish on a single spearshaft. This was for our safety, but also gave us more time to continue the hunt! When we ran low on oxygen, it was time to surface. We caught a total of 17 lionfish during our dive. 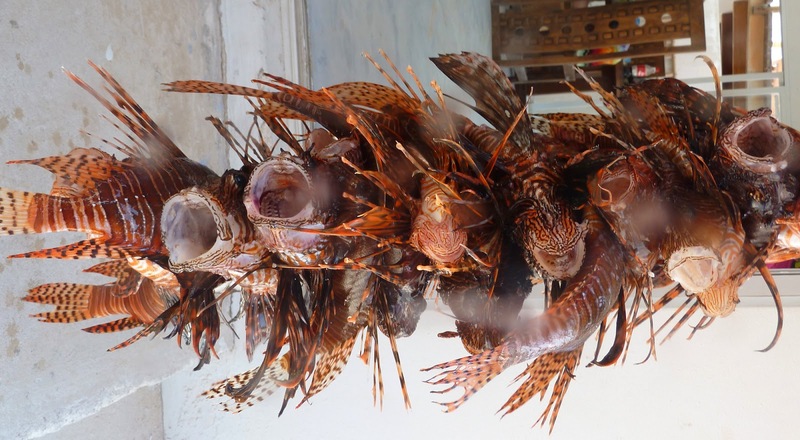 Locals are encouraged to help do their part in reducing lionfish populations: by eating them! The best part of our experience was eating our fresh catch, right off the beach. The cooks at the Yaya Beach restaurant next to Doctor Dive happily prepared lionfish for us…for free! They took half of the filets and prepared it as fresh lionfish ceviche. They battered and fried up the other half of the filets as delicious lionfish fingers for us to make fresh lionfish tacos. It felt extremely rewarding to be eating our fresh lionfish catches off the beach, with a cold beer in hand! Lionfish filets are very tasty. The meat is light, flakey, and almost has a buttery taste. I learned later that lionfish have the highest concentration of omega-3 fatty acids in their category of fish; more than tilapia, bluefin tuna, red snapper, and grouper. Eating this delicious fish was both nutritious and eco-friendly. We enjoyed doing our part in saving the local coral reef ecosystems. You can read more about lionfish hunting at the World Lionfish Hunters Association.